"Minimal prep time is needed for this tasty meal; let the oven do the rest! Big flavor comes from the addition of the Italian sausage and peppers while the PHILADELPHIA Cream Cheese adds a wonderfully creamy texture." Brown sausage with onions and peppers. Meanwhile, beat cream cheese and milk with mixer until well blended. Combine mozzarella and Parmesan. Reserve 1-1/2 cups; mix remaining with cream cheese mixture. Drain sausage; return to skillet. Stir spaghetti sauce, water and oregano into meat sauce. 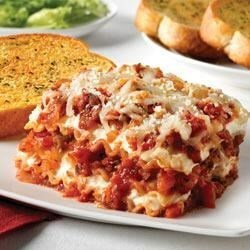 Spread 1/3 of meat sauce onto bottom of 13x9-inch baking dish; cover with 3 noodles and half the cream cheese mixture. Top with 3 noodles, half the remaining meat sauce and 3 noodles. Cover with layers of remaining cream cheese mixture, noodles, meat sauce and reserved cheese. Cover with foil sprayed with cooking spray. Bake 1 hour or until heated through, removing foil after 45 min. Let stand 15 min. before cutting to serve. Serve with toast. Variation: Substitute extra-lean ground beef for the sausage and 1 thawed 10-oz. pkg. frozen chopped spinach for the peppers. Squeeze spinach to remove excess liquid before adding to cooked ground beef and onions with the spaghetti sauce and oregano. Serving Suggestion: Enjoy this flavorful lasagna with a mixed green salad tossed with your favorite KRAFT Dressing. Easy Cleanup: Spraying the foil with cooking spray before using to cover the lasagna helps prevent the foil from sticking to the cheese on top. I added spinach I'd chopped into the cheese layer. It spread easily with the extra ingredient.